Liu Ming Rui – 1839-1933 – was from the Wanping County area of Shuntian Prefecture (an administrative area abolished in 1911 – but which corresponds today to the modern area of eastern Beijing). His ‘style’ name (given to a child at 2 years old) was ‘Xiu Feng’ (琇峰), and his common name was ‘Pan Chan Zi’ (盼蟾子). 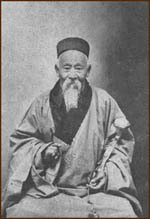 His Daoist name was ‘Qiao Jue’ (敲蹻). The history of the Namo Daoist School Lineage System (南无道派宗谱 – Na Mo Dao Pai Zong Pu), states that Liu Ming Rui was disease ridden during his childhood, and that his family life was seldom settled and comfortable. When he was around 20 years of age, both his parents died from extended exposure to suffering and exhaustion, and he was left alone. At this time, as he was young and strong, and was conscripted to serve in the military. He was soon promoted to the rank of squad officer by the government’s military awards department. However, one day, whilst on official business in Jiangnan Pei County, he encountered friends who gave him a copy of the Daoist classic book entitled the ‘Dan Jing’ (丹经) – or ‘Cultivation Medicine Classic’ – as a gift. After reading its profound content, Liu Ming Rui laminated the fact that his life was full of uncertainty and distress, and decided to give-up his post and retire to the mountains to become a Daoist hermit. Here he took refuge in the (Quanzhen) Namo School and entered the gate of the true mystery. He authored the following Daoist books entitled ‘Qiao Jue’s Penetrating Insight Text’ (敲蹻洞章 – Qiao Jue Dong Zhang), ‘Winding Heat Change Examination’ (盘熻易考 – Pan Xi Yi Kao), and ‘Perceiving the Source of the Profound Dao’ (道源精微 – Dao Yuan Jing Wei). These three books constitute Liu Ming Rui’s primary instructional texts. In the 26th year of the rule of emperor Guangxu (光绪) – which corresponds to the Western year 1900 – after living for many years in cultivated seclusion at the ‘Secondary Canal Village’ (次渠村 – Ci Qu Qun) area of eastern Beijing, Liu Ming Rui attained complete transcendence of the physical body, and became a truly ‘non-knowing’ (无知 – Wu Zhi) person. He passed away at the age of 93 and is considered a 20th generation Grand Master of the Namo School.